Factors to consider when procuring VSAT services. Buying a VSAT connection is not like buying DSL for your home or business - there are numerous factors to consider to get the best balance between cost and performance. Here are some pointers, but there are many other things to consider. Types of use: mix of VoIP (see definition), browsing, email (how many large attachments), instant messaging, etc. Number of simultaneous users and intensity of use. Your location and local climate will affect the desirability of using Ku or C band services. It will also determine which satellites are available, and the signal strength obtainable. Satellite which are relatively low in the sky from your location are less desirable than those which are relatively high in the sky. Line of sight from your intended antenna site to the chosen satellite must be unimpeded by buildings and other obstacles, including vegetation. Is local expertise available to install and maintain equipment and to provide ongoing support? VSAT installers should be qualified through approved Global VSAT Forum training courses. 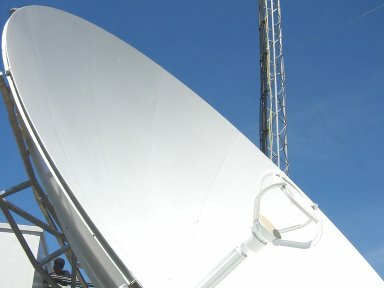 You really need to know what you are doing when you buy satellite bandwidth! Otherwise, you'll think you have bought a Ferrari and a wide open freeway, but in reality, you are stuck in a perpetual traffic jam. 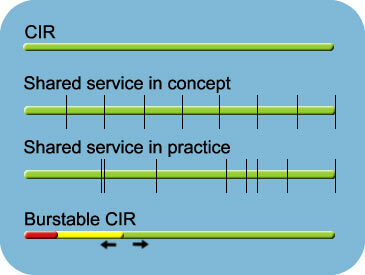 If you buy CIR (Committed Information Rate) bandwidth, you have it all to yourself, all the time. You pay a considerable premium for this. Most users will buy shared bandwidth. A number of users are given equal access to the given bandwidth. However, when some users are not using it, other may use it. Much Internet use is "bursty". For example, you download a web page, and then you read it for a while. While you are reading it, you are not downloading more, so someone else can use the available bandwidth to download the pages they want to browse. Many services share bandwidth on a "best effort" basis. At peak times, that means that you may only be able to get a very low allocation, which may be practically unusable. Another option is "burstable CIR". This means that you always have a guaranteed minimum bandwidth and when other users are not contending with you, you may get much more. Many services are asymmetric - the available bandwidth is higher for downloading than for uploading. Having decided on the type of bandwidth service to buy, it is important to be able to get the best from it. Due to the the different technologies employed, an apparently equivalent service from one supplier may be able to handle double the throughput of another. Systems which allow you to manage Quality of Service (QoS) will also allow you to get much better performance from a given mix of simultaneous user sessions. This is especially true when real time applications like VoIP are used. DRASTIC also acts as an aggregator, giving smaller customers access to the discounts and privileges normally only available to large corporate customers. You will understand by now that unless you know the VSAT marketplace, you will need guidance on the selection of the right solution for your needs. You can contact us if you would like to know more.